Tasmanians often debate whether Liffey or Russell falls are the most beautiful. The Liffey River rises on the northern edge of the Great Western Tiers in Liffey Falls State Reserve in Tasmania (TAS), Australia and plunges through dense rainforest of myrtle, sassafras and leatherwood. It runs over spectacular waterfalls before reaching rich northern farmlands and joining the South Esk River. This image belongs to the travel and nature stock photo library. This stock photo of Liffey Falls is available for licensing for commercial and editorial uses including websites, blogs, books, magazines, brochures and advertising. Restrictions may apply for images which contain third party copyrighted material or sensitive subjects. Photos of artwork are for editorial use only. 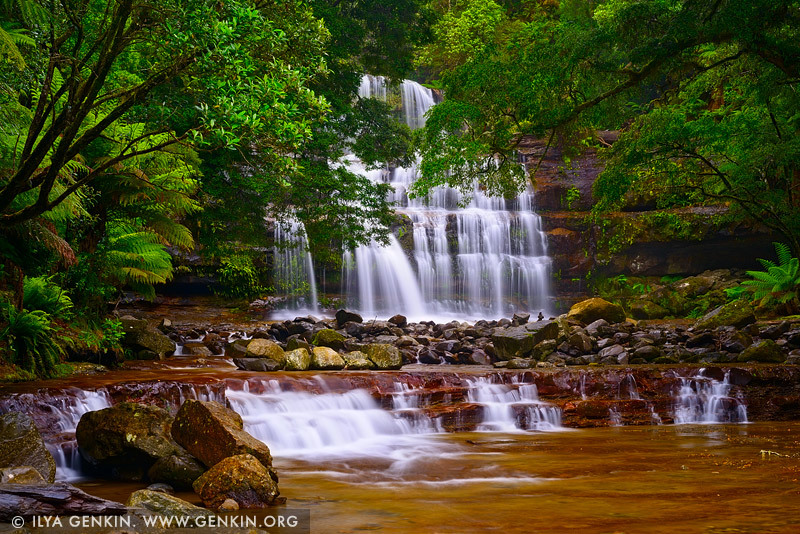 This image id TAS-LIFFEY-FALLS-0001 of Liffey Falls, is copyrighted © by Ilya Genkin. This is not a public domain image.